I’m more of a reader than a listener, but when I am in the car (like I will be a lot on my vacation) podcasts are just about the perfect way to speed the journey. 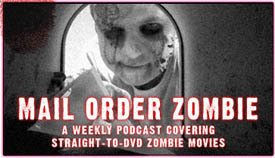 So while I am away, I’ll be catching up on the backlog of Mail Order Zombie, the best zombie podcast I’ve found. The show originally focused on direct-to-DVD zombie movies, but has since expanded to all things zombie, from books, to movies to games and more. It’s a once weekly, two-ish hour podcast with the hosts Brother D and Miss Bren, plus assorted guests. Each week, they review a few movies, answer some listener questions or respond to feedback, have a few guests, talk about their daily lives — you know, the usual podcast thing. It’s very professional sounding, apart from the fact that Brother D is not blessed with one of those incredibly deep, resonant “radio voices” you’re used to hearing on commercial radio. Apart from that very minor quibble, Brother D is entertaining and well-versed in all things zombie and an excellent, engaging host. I fully expect he’ll help the miles fly by. Check him out and tell him I sent you.